Not many books from Cambridge University Press make it to the summer reading list, but On Dissent: Its Meaning in America is one of the better ways to revolt against the light-hearted beach-readers out there. Hell, it’s patriotic. America was born in dissent, and we celebrate it still. With fireworks—even illegal ones (though from now on I argue that M-80s are not outlaws, but rather the tools of dissent). But why is dissent so much of our DNA? What does it even mean to dissent? These were the questions nagging at Ronald K.L. 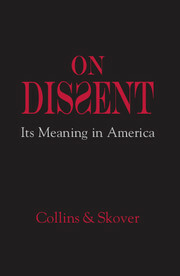 Collins and David M. Skover, two esteemed political scholars who were surprised to find that there was no true analysis of the concept of dissent. That’s what they set out to create with this short, thought-provoking work. For the most part, Collins and Skover accomplish their goal. The tone is philosophical in nature, and the authors begin by attempting to define dissent and identify its practitioners. Sure, anyone can point to the examples of Thoreau, King and Paine, but the authors take on trickier issues, such as how clear the line is (or isn’t) between civil disobedience and criminality. What role does violence play in dissent, or does an action cease to be dissent once it becomes violent? Collins and Skover do a great job, and scholarly service, by identifying the fundamental traits of dissent, such as its being goal-oriented and indicative of a power dynamic. They buttress their definition by exploring hypotheticals and philosophical dilemmas (is a hired protester a dissenter? ), and they do it all with an accessible writing style that will appeal to non-academic readers who might not otherwise seek out this book. Of course, it’s not perfect, and the biggest issue I have is with the authors’ overreliance on expert commentary, such as that of Howard Zinn and Ralph Nader. The quotations are often redundant and unnecessary. The collective intellect of Collins and Skover is authoritative enough, and I recommend skimming through the offset commentary. “Consent and dissent are two sides of the same coin. Without dissent, consent is meaningless; without consent, dissent loses much of its animating purpose” (152). On Dissent is a quick and wonderful read. It will get you thinking. It will get you talking. It will remind you that though we may disagree, the freedom to disagree and express opposing viewpoints is what makes us strong. are amazing, some of King’s best recent work. The ending, however, is a bit too easy and familiar. King’s previous offering through Hard Case Crime, The Colorado Kid, subverted convention and was far more challenging to the reader. Infused with heart and the nostalgic thrills of boardwalk carnivals, Joyland is worth the ticket price. The novel begins as a rail-rattling thrill ride, but, in the end, eases too gently into the station. Writing a memoir or personal essay is the literary equivalent of a high-wire act. It’s a thing of awe and wonder when it works, but the possibility of disaster is great. The margin of error is razor thin due to the “so what?” litmus test. All nonfiction needs to address this question, but it becomes far more stringent with memoir, which is the book version of going on a first date and talking only about yourself. As much as I want to love Hope After Faith (as a fan of atheism, philosophy and memoir), it ultimately fails to meet the “so what?” criteria. This is not the fault of content, but rather infrastructure. The structure of a memoir varies depending if the reader interest is on the writer or the event. One dives into Tina Fey’s Bossypants to learn more about the person. 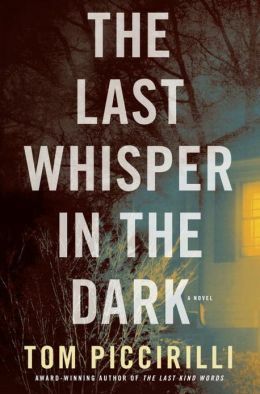 One picks up David Carr’s The Night of the Gun because they’re intrigued by the titular event, through which the reader will acquire interest in the writer. Unfortunately, Hope After Faith begins with a chronological account of Jerry DeWitt’s life. Nothing personal, but since I don’t know the author, I’m not yet interested in his life story. The narrative would benefit from a stated thesis or present commentary rather than launching straight into DeWitt’s life story. I’ve heard DeWitt is a great speaker, and I imagine he’d be a fascinating interview, but this is clearly a case where the prospective reader is drawn to the event more than the author. We hope to find the author interesting as well, of course, but the reason we crack the spine in the first place is to hear about his conversion. That said, while this memoir didn’t work for me, I can see it being of interest and even value to others. Just know that the emphasis is more on the faith, not as much on the after.